Our Lotion “B” is a perfect fit for oily skin that is prone to severe acne, cystic formations and folliculitis. For more mild cases of acne, it could also be used as a spot treatment for localized breakouts. With our uniquely designed delivery system, our Acne SOS line delivers acne-fighting actives (assembled as sub-micron spheres in slow-release capsules) for most effective delivery to your problem areas, without any irritation! It is designed to provide a soothing, hydrating, re-texturing, and moisturizing effect to oily or acneic skin, without causing shine or irritations. Fast absorbing formula clears pores and eliminates blackheads. Reduces inflammation, improves microcirculation, scar tissue and skin color. Softens stratum corneum (upper skin layer) and exfoliates dead skin cells. Lightens uneven skin pigmentation resulting from post-acne marks. 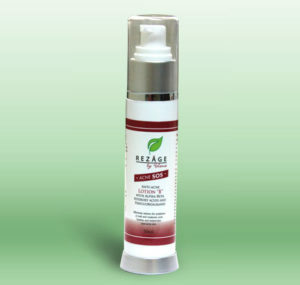 Regulates sebum production, purifies and balances oily acneic skin and tightens enlarged pores. Apply lotion onto clean face and neck if needed, avoiding eye area. Recommended to use in the morning (can be applied under make-up) and again at night before bed. Stop usage if irritation or rash develops. Keep out of reach of children. Recommended for more severe cases of Acne. Alpha hydroxy acid (AHA): Collection of compounds made from familiar food products, like lactic acid derived from sour milk. Use of these compounds has been known for centuries, going back to ancient Egypt. AHAs are known for their great ability to exfoliate and increase blood flow in the skin. They also brighten the skin and minimize fine lines, wrinkles and scar tissues. Beta hydroxy acid (BHA): Main ingredient of which is salicylic acid. Another great acne-fighting agent. In our products its naturally derived from willow trees. It kills pimple causing bacteria, cleans pores and exfoliates dead skin. BHA complex also possesses a great anti-inflammatory effect. Perfluorodecalin: A great oxygen carrier. Provides oxygenation to skin and therefore promotes healing, especially in affected areas like irritated and infected skin. Zina Oxide: Great antiseptic and antioxidant. Restores burnt areas and scar-tissues. Provides healing effect. Natural sun-protectant. Bisabolol: Naturally derived from Chamomile (pharma grade), bisabolol calms and soothes irritated skin. It’s a natural anti-septic. Reduces redness.